Worried by the design of a new bridge that will replace the present iconic Clarin Bridge in Loay, residents of Barangay Poblacion Ubos refused the entry of the Department of Public Works and Highways (DPWH) personnel to carry out initial staking survey pending resolution of their opposition to the project. A Php445,772,869.37 Nielsen bridge will be constructed right beside the Clarin Bridge in Loay by the winning bidder, a joint venture between V.T. Lao Construction and PT. Wijaya Karya (Persero) funded by a loan agreement with the Japan International Cooperation Agency (JICA). A Nielsen type bridge is a tied arch bridge with inclined hangers that cross each other at least twice, according to Engr. Bernardo Austria, DPWH project consultant. Fifteen residents of Barangay Poblacion Ubos wrote DPWH Secretary Mark Villar on July 12, 2018, expressing their “strong opposition over the consequence and negative effects on their properties” due to the controversial design of the bridge project. The residents requested that the new road alignment and the new bridge will remain at the level of the old bridge and road elevation. 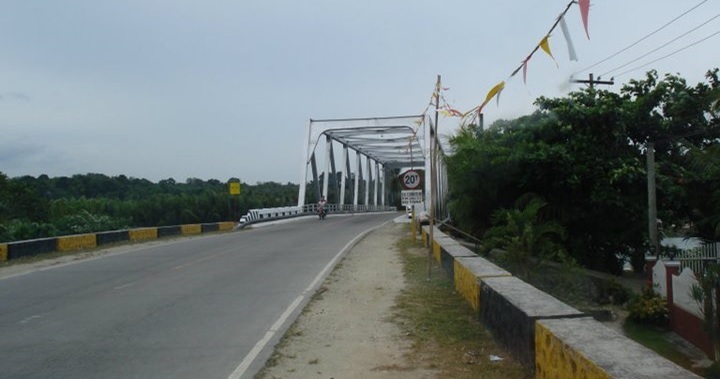 According to their village head, Primo Espiritu, a signage posted by the DPWH described the project as a reconstruction of the existing Clarin Bridge caused confusion among the residents since a perspective of a new bridge adjacent to the old bridge was also prominently displayed in the signage. The Chronicle learned that a representative from the office of DPWH Undersecretary Emil Sadain will discuss with the residents a proposed memorandum of agreement that will assure the prompt payment of just compensation under the provision of Republic Act (RA) 10762 known as “Right of Way Act”. However, the request to redesign the bridge remains uncertain considering that the project has been bidded out with construction now delayed by two months and is expected to be completed within 18 months or by October 7, 2019. Japanese engineers recommended the closure to vehicular traffic of the Clarin Bridge and put up a new bridge after an inspection revealed that the foundations did not meet the minimum load and seismic requirements for bridges. The furor manifested by the residents started after a letter signed by then newly-elected Municipal Mayor Rochelle Brigette Lim-Imboy shortly after she took office assured DPWH officials and the contractor that alleged objections earlier raised by concerned residents were already ironed out. However, the concerned residents claimed they were caught unaware of the drastic change in their surroundings and denied that they were consulted by Imboy which led to an emotional confrontation with the project engineer and representatives of the winning bidder. The mayor, during a previous meeting with the DPWH, winning bidder and affected residents assured the affected residents that she will personally keep a close watch of the progress of the construction to safeguard the welfare of her constituents. The design of the 104 lineal meters new bridge, which according to the project engineer is the second Nielsen type bridge in the country, will be 3.5 meters higher than the existing bridge. The new bridge will drastically alter the landscape of the municipality with the construction of approach roads with a total length of 425 lineal meters and width of 7.92 meters. Seriously affected by the design of the new bridge are the floating restaurants, the town’s top tourist draw. Parking and docking areas will have to transfer during the construction phase while a permanent location is still in the planning board with the safety and comfort of visitors as its main concern. The sloping elevated two-lane approach road will be constructed at the center of the existing national highway starting at the San Antonio Chapel in Barangay Ubos along the national highway and the approach road at the other end will begin close to a road leading to Villa Limpia beach at Barangay Villalimpia. The approach roads will effectively isolate both sides of the highway by a solid concrete wall prompting residents to request for a new road alignment and to lower the height of the new bridge to the level of the existing bridge. The DPWH has acceded to the request of the residents for access roads at both sides of the approach roads and an opening for vehicular and foot traffic to ease passage from both sides. The new Clarin Bridge Project broke ground on May 16, 2018 with no less than DPWH Secretary Villar, Cabinet Secretary Leoncio Evasco, Jr., 3rd District Congressman Arthur Yap, Cebu City Mayor Tomas Osmena, Mayor Lim-Imboy, Provincial Administrator Alfonso Damalerio, Special Envoy to China Fernando Selim Borja, JICA and Indonesian Embassy representatives and DPWH 1st District Engineer Francis Antonio Flores in attendance.